ProFlex Back Support utilizes a weight lifter design for rigid back support. 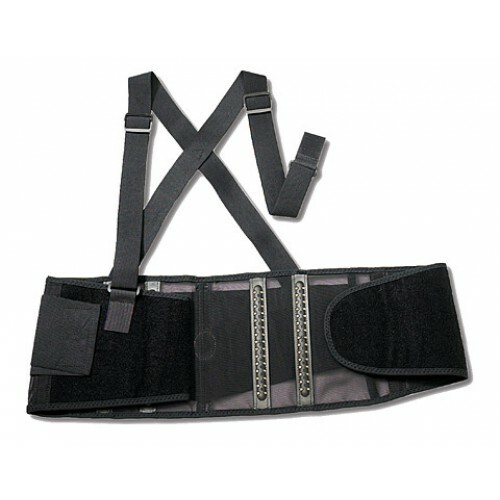 This back lifting support design supports the back of those who do heavy overhead lifting. The ProFlex Back Support is manufactured by Ergodyne, a company that focuses on products to support the workplace. This Back Support comes with patented Sticky Fingers® Stays that deliver firm continuous support to lower back and abdominal muscles, and reduce back support ride-up. The ProFlex Back Support has nonconductive stays with maximum gripping properties to reduce ride-up. 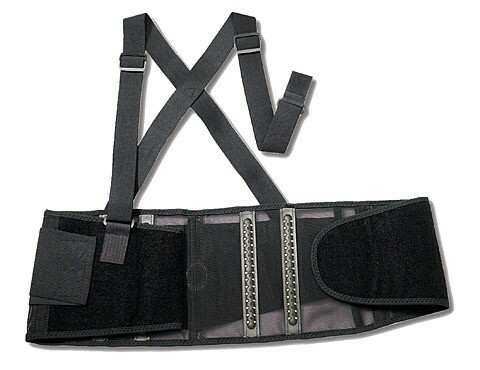 The ProFlex Back Support is adjustable to provide an exact fit with detachable 1-1/2 inch-wide knit suspenders. Stretchable bias binding with zig-zag stitching. Ergodyne ProFlex Back Support Model & Product ID Numbers: 1000SF, 2000SF, 11601, 11602, 11603, 11604, 11605, 11282, 11283, 11284, 11286. Closure Type: Two stage closure. I wanted something easy to get on and fast to get on. The ProFlex Back Support does that with its Spandex construction. Got to love those Sticky Stays!